Revocable trusts have a popular mystique all their own, but they’re not all that different from wills. Trusts avoid probate and wills do not, but both are open to lawsuits brought by disgruntled beneficiaries. The major difference is the court you use to challenge a trust. Since a trust is not subject to probate, you generally would not use the probate court. In most states, civil courts hear these matters instead. Review the trust documents as soon as possible. You can’t challenge a revocable trust until it becomes irrevocable, which occurs when the grantor dies. Many states, such as California, require that the trustee give you written notice of this event within a certain number of days after the death. The notice gives you the right to request a copy of the trust documents, which you generally can't view while the grantor is alive. If you suspect there might be a problem with the trust, act quickly. Depending on your state’s laws, you may have a limited period of time to make a challenge if you’re correct and something is amiss with its terms. Gather evidence to prove your objection. In most states, the grounds to contest a trust are the same as the grounds to contest a will. Do some research to find out if your objection is valid under your state’s laws. Prepare a complaint against the trust. Forms are usually available on the Internet, but you might also find a format to follow in a law or public library. 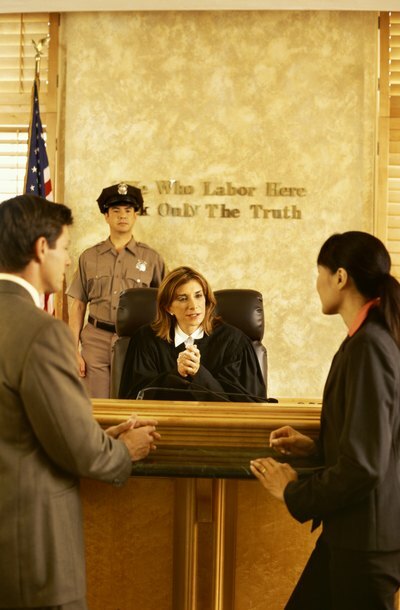 Detail your objection to the trust and file it with the appropriate court. You would generally do this in the county where the grantor lived when he died. Send a discovery request to the trustee after you've filed your lawsuit. One option is to send interrogatories, which are questions that the trustee is obligated to answer under oath and penalty of perjury. Ask him to name and identify his witnesses and the topics on which they will testify. Ask for copies of any documentation he plans to produce at trial. Get as complete a picture as possible of the fundamentals of his case so you can collect more evidence, if necessary, to rebut them.